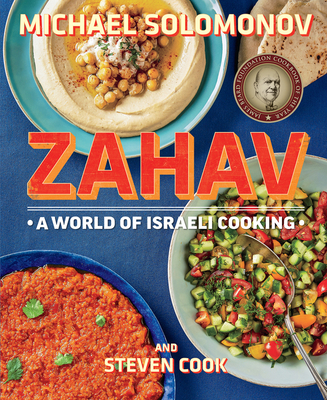 "After stints working with chef Marc Vetri in Philadelphia and as head chef at Marigold Kitchen, Solomonov developed a passion for Israeli cooking and his desire to show the full breadth of the cuisine began to take shape; he started his own restaurant, Zahav, in Philadelphia in 2008. Six years later, he won the James Beard award for best chef in the Mid-Atlantic region. Solomonov shares his story as well as his wide-ranging approach to Israeli cuisine in this impressive collection of recipes that are sure to challenge readers’ preconceptions. In addition to kibbe, kugel, latke, and rugelach, Solomonov offers chicken albondigas, the Spanish tapas standard; cashew baklava cigars; and the Chocolate Almond Situation, his riff on the flourless chocolate cake. To these stunningly simple dishes he adds deliciously decadent fare such as duck and foie gras kebabs, and beluga lentil soup with marrow bones. Solomonov isn’t one for showmanship (or waste—the juices from his Israeli salad of cucumber, tomato, parsley and lemon are added to gin to create an unusual martini), and virtually all the book’s recipes are within the reach of novice cooks. The reader’s biggest challenge will likely be mastering the ubiquitous tehina sauce used as a foundation for hummus and as an accent in countless dishes. Readers with an adventurous palate and an open mind will be richly rewarded by this terrific debut."